If you like to be safe when you shoot your muzzleloader, then you'll love to use our Powder Measure . 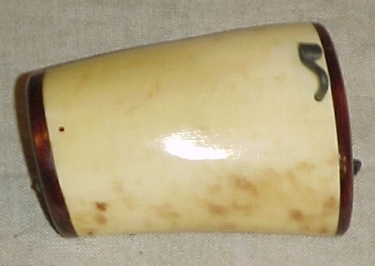 It is made from a deer antler and has the grains it will hold carved into the horn. Safe to use because it will not cause a spark. It comes in 5 grain increments from 20 grains through 120 grains. 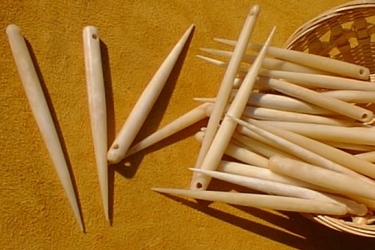 Do you want a Buffalo Bone Awl ? Boy, have I got a surprise for you, we have them. 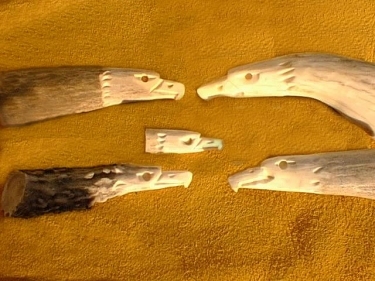 Made out of bone one at time just for you. 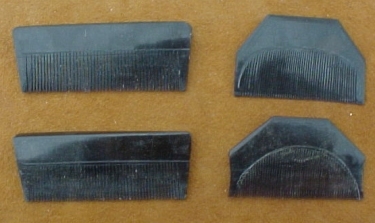 About 5 inches long and 1/4 inch in diameter with a small hole drilled in the end so you can put a lanyard on it. We have plain ones, ones with etchings on it, and one with the etchings darkened to black. Choose your favorite. 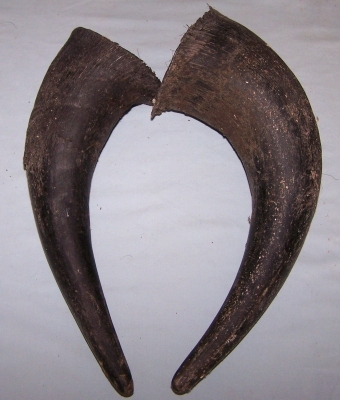 The Deer Antler Awl will vary in size because of the deer antler used, but all of the metal points are sharp. The awl is especially useful when working with heavy leather, like making moccasins, shoulder bags, possible bags and belt bags. 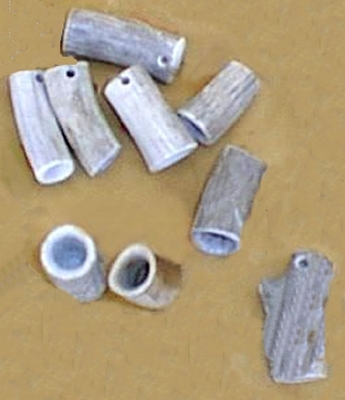 This Bone Hairpipe is really bone. Make your own chokers, necklaces or buttons. 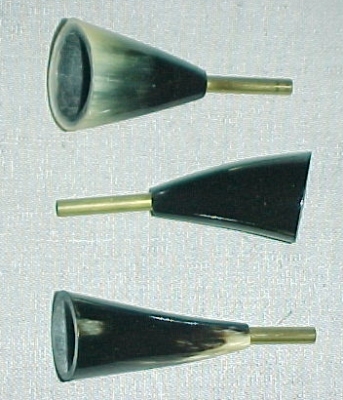 We have hairpipe in black horn or bone white, size range from ½ inch to 4 inches. Highly polished and so pretty for all your needs. 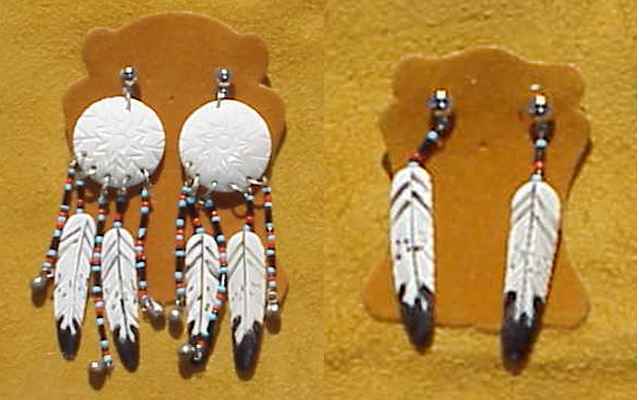 Beautifully carved Buffalo Bone Earrings are hand carved and have hand painted feathers. We have two styles at this time. They are very unique and very stylish. Choose which one is your favorite. Button, button, who's got the button; here it is! 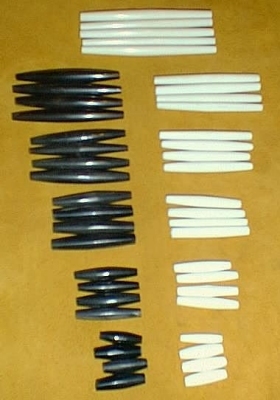 The Deer Antler Button is used on everything: shirt, pants, dresses, shoes, bags, chokers, toys, games, suspenders, and the list goes on and on. Small (up to dime size, medium (up to quarter size) or large(out of stock) we got 'em. Want a neat drinking cup? 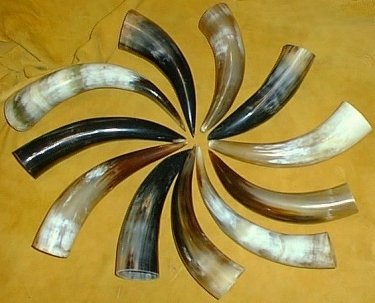 Then get a Horn Cup made from a cow horn. Great for all those cold drinks like cola, beer and spirits. The horn helps to insulate and keep your drink cooler longer. 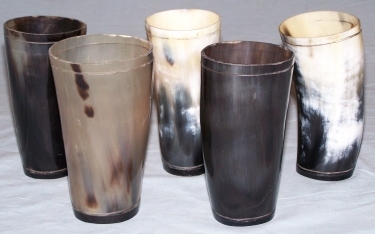 Each cup is about 5" tall and the top is around 2 ½ to 3 inches across. Color selection is distributed at random. Here is a toast to you, may you have good health, good fortune and happiness.